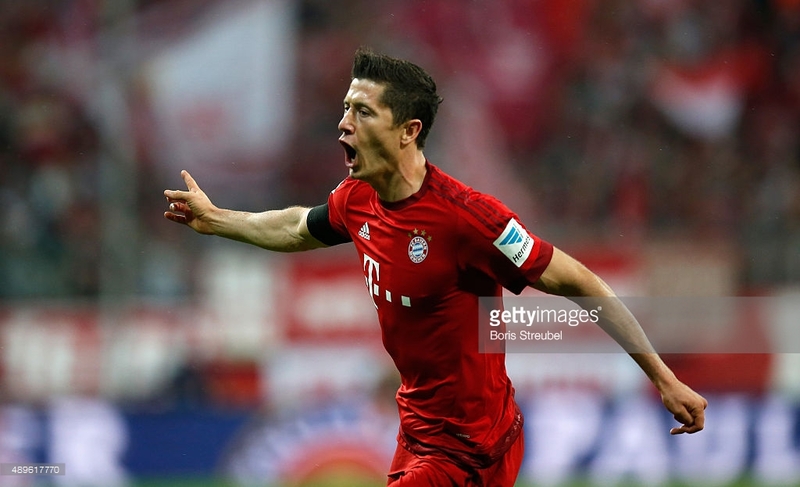 Robert Lewandowski of Bayern Munich celebrates after scoring his second goal during the Bundesliga match between FC Bayern Muenchen and VfL Wolfsburg at Allianz Arena on September 22, 2015 in Munich, Germany. Robert Lewandowski scored five goals in nine minutes to single-handedly defeat Wolfsburg at the Allianz Arena. Dieter Hecking made three changes to the side that defeated Hertha Berlin over the weekend, as Ricardo Rodriguez, Bas Dost, and Luiz Gustavo played a role in the away side’s 4-4-2. Pep Guardiola fielded his strongest XI in a 4-3-3 system. Thomas Muller, Douglas Costa, and Mario Gotze started upfront – keeping Lewandowski on the bench – while Thiago Alcantara, Xabi Alonso and Arturo Vidal formed a midfield trio. This was a peculiar encounter between the top two Bundesliga sides of last season, which witnessed the runners-up start superbly, only to be outdone by what may be the best individual display of the season from Lewandowski. Many can classify this encounter as a match of two halves involving Hecking implementing the same defensive approach that handed the Bavarian’s their first domestic loss in last year’s title winning campaign. Put simply, Wolfsburg aimed to prevent Alonso from dictating the tempo from deep. The away side dropped into two banks of four out of possession with Dost and Max Kruse alternating roles – when one forward stepped forward to press the ball carrier, the other remained goal-side to Alonso. Daniel Caligiuri and Julian Draxler quickly pressed the Bayern full-backs, whereas Joshua Guilavogui pressed Thiago, forcing the Spaniard to drop deeper to receive possession, thus limiting space to link play with Muller. Alonso, in fairness, offered an improved threat via set-pieces, but it was evident Wolfsburg’s initiative was to thwart Bayern’s vertical play. The reigning champions penetrated central areas occasionally in the first half due to Luiz Gustavo’s poor positioning throughout, but out of possession, Hecking’s men were fairly comfortable. In retrospect, Wolfsburg’s success without the ball insinuates Bayern encountered difficulties in the attacking phase. Bayern particularly struggled in central areas as neither Thiago nor Vidal were able to power the hosts forward. Oddly, Vidal received ample space behind Gustavo to surge forward – he was always positioned behind the Brazilian – but was unable to receive the ball in these zones. There was a three-minute span that saw David Alaba step forward to find the Chilean in a pocket of space, whilst Gotze located Muller behind Dante, but neither player tested goalkeeper Benaglio. Douglas Costa, arguably Bayern’s most impressive performer this season, looked dangerous when he cut in from the right, and though Gotze often bamboozled right back Christian Trasch, the German’s productivity from the left was scarce – the 23-year-old equally failed to balance wide areas to combine with Juan Bernat. With that being said, Thomas Muller was deprived of service of front, with Wolfsburg’s centre-back duo of Naldo and Dante tacking the German’s movement. There was one moment in the 37th minute involving Muller dragging Naldo into midfield before charging behind the defender, which vividly expressed the simplicity in breaking down the Wolfsburg defence. Although Bayern dominated possession in the opening half, failure to increase vertical passes from midfield proved crucial, as most areas were stifled by the away side. Though Wolfsburg didn’t counter-attack with the great efficiency displayed last year, a distinctive pattern recurred when they occasionally broke forward. Frankly, the powerful running from Ivan Perisic, and Kevin De Bruyne’s ability to link midfield and attack was missed, yet the away side still posed a threat. Bayern was wary of Wolfsburg’s threat in transition and dropped into a compact 4-5-1 when the away side enjoyed spells of possession, and it was unsurprising to see their best chances stemming from wide areas on the break. Yet, the lackadaisical approach from both Bayern full-backs was peculiar: Philip Lahm allowed Draxler infield to test Neuer, while Juan Bernat didn’t close down Caligiuri’s cross into the six-yard box, which narrowly evaded Draxler. Wolfsburg’s opener equally stemmed from this route of attack – a tried and proven method to discombobulate Bayern’s defence by launching balls towards the flanks following slick passing. Trasch’s desperate clearance saw Dost and Draxler combine, with the latter instantly clipping the ball into space behind the advanced Bernat – Caligiuri drove into the box and fired an unstoppable shot past Neuer. Likewise, the champions were fortunate not to be two goals down, as Neuer’s failed attempt to sweep up Benaglio’s long punt led to Caligiuri laying the ball off to Guilavogui, whose audacious shot from half bounced off the post. Perhaps a languid display from both full-backs enabled Wolfsburg’s joy in wide areas, but Hecking’s attempt to replicate last year’s successful approach against the champions was evident. Ultimately, there were two significant factors to Bayern’s impressive turnaround – the first being Guardiola’s decision to shift the team’s shape to a 4-2-3-1. Bayern weren’t poor in the first half, but the change in shape offered penetration in central areas due to an additional striker, whilst Alonso finally received time and space to influence the tempo. Alaba moved to left-back, Vidal dropped deeper alongside Alonso but was free to bomb forward, Javi Martinez is a fine passing outlet from the back, while Muller roamed between the lines behind Lewandowski. Now, Wolfsburg’s Brazilian centre-backs were both occupied, offering a legitimate threat to a back four that lacked protection from Gustavo. Muller and Lewandowski operated effectively as the ideal strike partnership, and the movement from both men was the catalyst to the subsequent goal fest. In short, this was a simplistic attacking ploy that offered improved direct play and width. Here, the game’s star player was Lewandowski, scoring the fastest hat-trick in Bundesliga history, whilst dominating a nine-minute spell that eviscerated last year’s runner-up’s. The Polish striker occasionally drifted wide, and into narrow pockets of space, but with Muller dropping between the lines – effectively dragging Dante out of position – Lewandowski freely ghosted into the box on countless occasions. Gustavo’s poor shielding left the Wolfsburg centre-backs vulnerable against Lewandowski and Muller’s movement. Lewandowski’s opening goals, however, were quite fortuitous, with Dante’s desperate tackle guiding the ball into his path, while Costa’s header evaded Muller and Gustavo into the path of the Polish striker, who ran towards goal and fired a low shot past Benaglio. The third goal vividly illustrated the improved the positional issues Wolfsburg’s centre-backs encountered in the second half combined with their disjointed high-pressing. As Bayern bypassed the pressure with short passes, Lewandowski dragged Naldo to the left-flank at the halfway line, and Vidal slid a sumptuous pass between Dante and Gustavo for Muller, ultimately resulting in a 3v2 in the box leading to Gotze finding the Polish striker unmarked to complete his hat-trick. Lewandowski’s final goals involved clever wing play from Alaba and Costa, as the latter stormed past several challenges with his pace and power, and a combination of Muller dragging Dante out of position and a well-weighed Gotze cross: both incidents saw Lewandowski ghost past Gustavo and Naldo in the buildup. It was a remarkable individual display showcasing the Polish striker’s power, intelligent movement, and clinical finishing that makes him one of the most revered player’s in world football. In terms of significance, this may not be equivalent to Lewandowski’s performance against Real Madrid two years ago, but the dominance can’t be understated. However, it was intriguing to see both sides effectively adopt simplistic methods of attack to achieve superiority. Hecking’s decision to negate Bayern’s passing and aggressively press the full-backs limited productivity in the final third, whilst exploiting deficiencies in wide areas in transition. It proved successful once again, but losing key attacking players over the summer possibly prevented an improved score-line. Guardiola, however, deserves plaudits for the decisive tactical move: Bayern encountered difficulties connecting midfield and attack in the first half – therefore, Muller was outnumbered and isolated around the box – but the alteration left the centre-backs isolated against two of the games intelligent attackers. With a half hour remaining, Bayern comfortably earned three points due to improved direct play. The willingness to defend in numbers showcased the fear of being blitzed in transition, combined with the half-time tactical alteration highlights Guardiola’s brilliance and Bayern’s overall flexibility. But there still appears to be an issue in wide areas via transitions, but if Guardiola’s men can replicate the former, this may finally be the all-round powerhouse that Bayern supporters envisioned upon his arrival.